Former Nets star Jayson Williams has been charged with a DWI after he crashed his SUV into a tree in Manhattan early Tuesday, cops said. Other charges are pending, NBCNewYork has learned. Williams, who suffered a bone fracture in his neck, was in the passenger seat when officers arrived and told them someone else had been driving. But witnesses told police they saw him in the driver's seat, and officers said no one else was in the car. 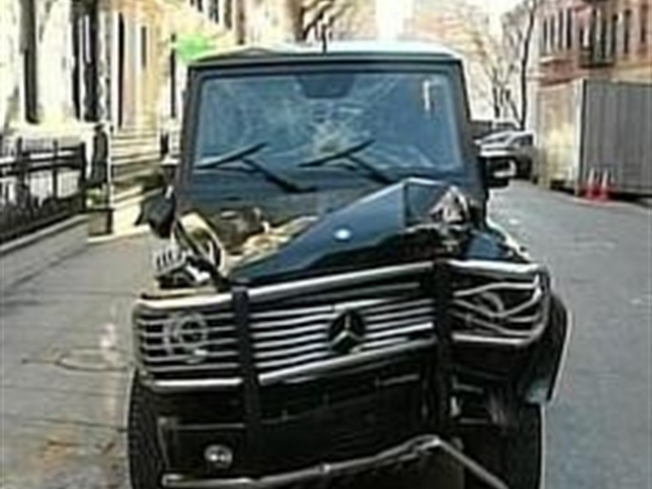 The black Mercedes-Benz SUV veered off the curved exit at East 20th Street, authorities said. The front of the car was smashed, the windshield shattered and a passenger-side mirror hung forlornly on its side. Williams refused a Breathalyzer test at the scene of the accident, authorities said. He was taken to Bellevue Hospital and arrested on DWI charges. The name of his attorney was not immediately on record. Last month, lawyers in New Jersey asked to be removed from his defense against a reckless manslaughter charge stemming from a 2002 shooting. Williams retired from the New Jersey Nets in 2000 after a decade in the NBA, unable to overcome a broken leg suffered a year earlier when he collided on court with a teammate. He was suspended from his job as an NBA analyst for NBC after the shooting. Williams is scheduled to be retried on the reckless manslaughter count that produced a deadlocked jury in 2004. Witnesses testified that Williams was showing off a shotgun in his bedroom in February 2002 when he snapped the weapon shut and it fired one shot that struck a hired driver, Costas Christofi, in the chest. They also testified that Williams initially placed the gun in the dead man's hands and instructed those present to lie about what happened. The jury deadlocked on the reckless manslaughter count, acquitted Williams of aggravated manslaughter and convicted him of covering up the shooting. He was never sentenced for the cover-up counts, pending the outcome of the retrial, and has remained free on bail. The former NBA player was supposed to appear in court in late November to enter a plea, but the hearing was delayed indefinitely, partly because of travel difficulties. Williams was expected to cut a deal that could send him to prison for three years because of the accidental shooting. The case has already dragged on for eight years. Williams went from the hardscrabble streets of the Lower East Side where he would dribble a basketball up the stairs of his high-rise apartment and shrug off criticism of his speech impediment to one of the city's top ball players in high school. Despite the death of his two sisters, both felled by AIDS, the young phenom went on to be a stand-out ball player at St. John's University.